In an attempt to use up some of the evidently faux ricotta (better called paneer or queso fresco) I made a couple of days ago, I've been bookmarking recipes like a crazy person. Cheesecake was out because there's only two of us, and who needs the temptation of an entire cheesecake anyway? Didn't really feel like going the lasagna rout, at least not right away. So I chose this recipe from Deborah Madison, the grande dame of vegetarian cuisine. 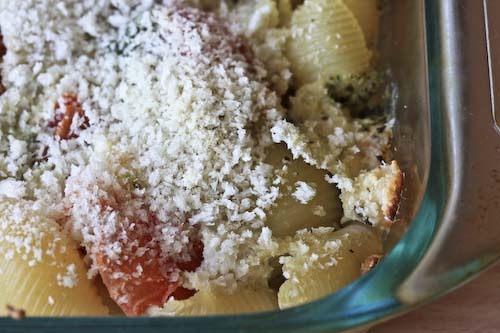 Here are the things I love most about this recipe: the surprise pockets of ricotta hidden beneath a coating of panko, swirls of beans and roasted tomato, and shells that fill themselves up greedily with stock and cheese. Those shells and I have a lot in common. But the best part of this dish are the spoonfuls of pesto nestled in and among all of that other good stuff. Little explosions of spring, of bright green color, peaking out from among the pillows of white. I do have to warn you, however, that the stock remained a bit runny through cooking, but I'm willing to overlook that. I left most of it behind in the dish when I served it. Next time, I'd use an entire onion instead of half, only because I hate ending up with halves. And we love onions. But it's perfect for this time of year, because even if the tomatoes aren't at their most flavorful, the oven will coax something sweet out of them. And if you feel yourself to be on the cusp of spring, even if the weather is not yet cooperating, this just might push you over. And give you someplace lovely to land. Boil the beans in fresh water for 10 minutes. Drain and set aside. Heat some oil in a soup pot and sauté the onion, bay leaf and thyme over medium heat for a few minutes, until softened. Add the drained beans and 6 cups of water. Increase the heat to bring to a simmer, then cover and continue to simmer for about 30 minutes. If you need to, add additional water so that the beans are covered. After 30 minutes season with salt, recover and cook for another 15 minutes. Remove from the heat and set aside. In a food processor, process the garlic and basil until everything is chopped. Add the cheese and enough oil to moisten, I used about 2-3 tablespoons. Process until you reach the consistency of a coarse puree. Season with salt and pepper to taste. Oven preheated to 350F. Oil a large baking dish. Cook the pasta in salted water until more al dente then usual, as it will continue to cook in the oven. Drain the pasta and run under cold water to stop the cooking process. Drain the beans from their broth over a large bowl, reserve the broth. In the oiled baking dish, combine the pasta, beans, 2 cups of the bean broth and the tomatoes. Nestle spoonfuls of the pesto and the ricotta into the bean mixture. Spread the panko over the top, then bake for about 35 minutes, until heated through and browned. * I tend not to peel my tomatoes because, well, I just don't really care enough about tomato skins to bother. Nothing has ever been the worse off for it. * In the recipe, Madison suggests 6 tablespoons of olive oil for the pesto, but I found that using just enough oil to moisten it was sufficient, especially because I didn't need it to hold up structurally. Beans, pasta and cheese sounds really good! Love warm white beans...I like 'em with goat cheese and portobellos--do you think you could add to this dish with success? 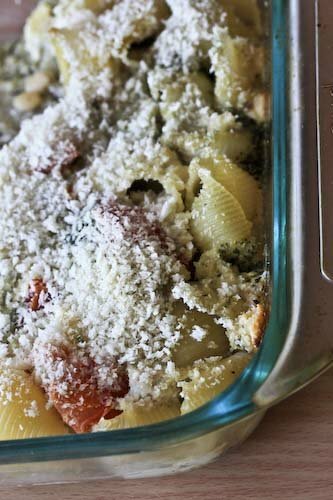 I love baked pasta dishes. They're always so great to make in advance. And I love the addition of beans. Thanks Andrea! Unconfidential Cook, oh yes, definitely. In fact, this dish is relatively basic and I think it could really benefit from some of those additions. Thanks Snooky, Kevin and Hayley! You guys rock! Just the comfort food for a wintry evening (or evening of any season, for that matter)!